So what are the implications of Amazon’s moves to deliver their own products? First, lets be clear. This is not about delivery alone. Second, Amazon is dead serious. 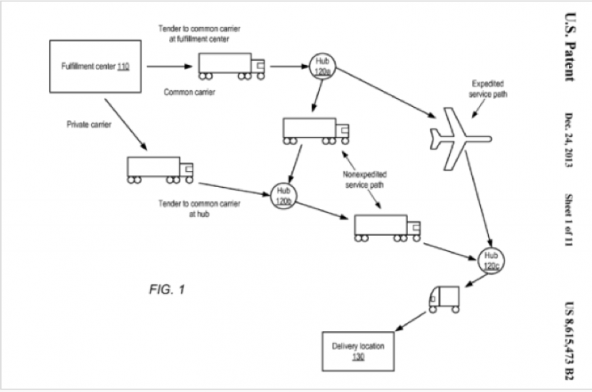 In January 2014 Amazon filed a patent application illustrated by this graphic. With this illustration Amazon describers a world of forward positioned warehouses and rapid fulfillment of eCommerce orders. For those who don’t shop on the Amazon site, the company has long ago earned the title of The Everything Store as described in the recent book by Brad Stone. You can buy everything there – from books and music to televisions to lawn furniture. Some of these goods are more likely to be purchased if the consumer can get them the same day or the next day. And for the retailer, the knowledge of who who will want which product when they can get it immediately is more valuable than the return from the sale itself. What’s more, the market is not limited to the impulse end of the online eCommerce market that you can see today. When you can fulfill products overnight, the scale of the marketplace expands to the Consumer Package Goods market – a multi trillion dollar marketplace. Walmart knows this and they are experimenting with delivery themselves. Soon every retailer in the Consumer Package Goods market is going to be confronted with the reality of the change that Amazon has anticipated. The picture above anticipates another point as well – for those competitors who can reshape themselves as collaborators in a radically changing market, there may be new opportunities that have not been factored into the conventional forecasts. No one should miss, for example, the fact that the U.S. Postal Service’s Sunday delivery volume from Amazon is exploding. Where will Amazon deliver its own products and where will it rely on competitor-collaborators? The answer to the question of where will the future of delivery be? will depend on a larger picture than one that is limited to the supply chain. The future is going to be defined by seeing the whole board. that this site needs a lot more attention. I’ll probably be returning to see more, thanks for the information! Excellent goods from you, man. I’ve have in mind your stuff previous to and you are just too great. what you are stating and the best way during which you say it. It is actually even more durable, cheaper, and totally weather resistant. This all adds up to great quality and great prices for you. Earlier, buying and selling antiques was considered as a lucrative business. Estoy alucinado de haber visto con esta página web y poder disponer de tanta información. Great website. Plenty of helpful information here. I’m sending it to several pals ans also sharing in delicious. be at the web the easiest thing to bear in mind of. sufficient for me. In my view, if all webmasters and bloggers made just right content material as you did, the net will likely be much more helpful than ever before.